True Believers of the Multiverse unite! Coming to the Giant Center November of 2015, “an original, live-action arena experience” like no other.. This original story will bring together more than 25 Marvel characters for one epic quest.. The source of ultimate power, the Cosmic Cube, has been shattered by the Mighty Thor to prevent this power from falling into the wrong hands. As the villains team up to capture the fragments which have been scattered across the globe, the heroes are planning the same! 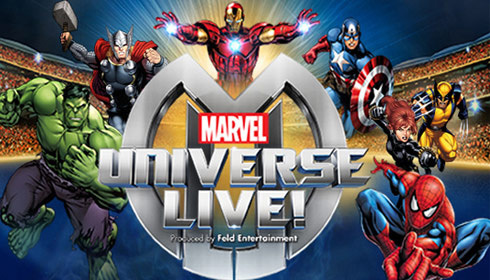 You will see The Avengers – Iron Man, Captain America, Hulk, Thor, Spider-Man and Wolverine team up to retrieve the fragments and do battle against Loki, Green Goblin, Doctor Octopus, Red Skull, Madame Hydra, Aldrich Killian, Electro and more Marvel villians. Enjoy many special effects including martial arts, aerial stunts, pyrotechnics and much more. Book now at 1825 Inn Bed and Breakfast right next to Hershey PA….just minutes away from Giant Center!